There's nothing like a factory finish to bring down the curtain on your opponents. And it's available any time you want it. Will return your ball to new condition. I would recommend this polish to anyone to use for good results. I've had a ball spinner for several years now, and although I could get a nice shine on my balls, until I tried this product, I couldn't get that deep factory shine. A guy in our league recommended this, and I am glad he did. It is really simple to us-just follow directions on the bottle, and it put the shine on! I really like this stuff, and it makes my spare ball a little 'longer', which I wanted--plus the balls look great! By t-dog from brownsville tx. I bought this to help me power through oily lane conditions, works well with power house clean and dull. leaves THE Most tackiest surface I've ever obtained from any polish. the 800 grit is nice for the start of league when the lanes are conditioned. but when the lanes start to dry out maybe around the 3 game of league...I did notice that it starts to hook more and more, next thing you know your left gutter shooting the center arrow. Both the Factory Finish and the Ultra Shine give you the same effects by increasing the length and backend but have no effect on the over all hook. The composition is slightly different on the ultra shine and some people prefer the way the ultra shine works while others prefer the powerhouse factory polish. It will be a personal preference on which you prefer. 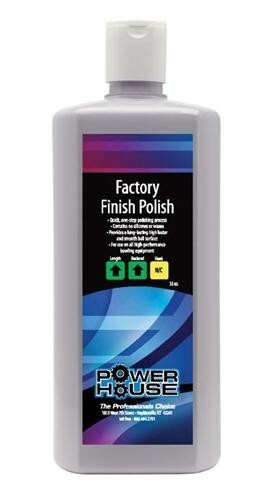 Due to the time it takes to produce the Powerhouse Factory Finish Polish Quart ball it will ship in immediately. We cannot ship this ball outside the United States.